For many people taking a trip to Rome is something for them to cross off their ‘to-do’ list. From the Colosseum to the Piazza Navona it’s a feast for the eyes – and the stomach does pretty well out of it too. Rome has held true to its cultural and historical dishes by serving what was once considered ‘poor man’s food’ with such aplomb that Italian food is world renowned for its deliciousness. The airport alone has a wide selection in Boarding Area B you will find a buffet from a Michelin-starred chef – Antonello Colonna Open Bistro is fantastic. For Lighter options hit up Foglie – a create your own salad place – nice starter before the carb overload on pizza and pasta later. But enough about the immediate joys of landing in Rome. Parliamo di Viaggi! (Let’s talk about travel). Specifically getting from Rome airport to city center. Let’s start with the most luxurious way. Luxury, which by the way only costs a few euros more than a standard taxi*. 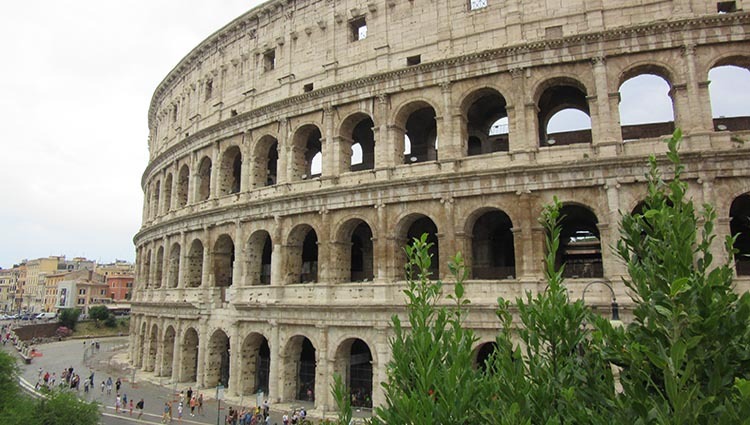 Booking a car for your arrival, going from FOC to Central Rome will cost around 48 euros for two people and two bags. Which is a bit of a bargain considering the relaxation you can have for the duration of the drive. The better services have the option to pick up extra tickets with queue-jumps for many of the main attractions, SIM cards, a list of WiFi spots, and may even be able to hook you up with souvenirs from the local places. As well as having a wealth of local knowledge, plus your price is guaranteed. It makes sense to start your trip in Rome how you mean to carry on. Comfortable, relaxed and fully informed. There are two main train options from Fiumicino to Rome Termini train station. But the best, and fastest is the Leonardo Express train. This costs about 14 Euros per person but will get you where you want to be in around 30 minutes. If you are more than two people, it begins to be less cost-effective, and of course, as Fiumicino is the busiest airport in Rome, it’s going to be quite busy. Luckily it leaves every half an hour and is running from just before 6am to 11pm at night – which is perfect for those cheaper flight times. You can buy tickets online for your chosen time, so you don’t have to worry about finding a ticket machine when you arrive. Your second, more scenic route option is the Sabina-Fiumicino line which costs around 8 euros, and stops at a few more places. Trastevere, Ostiense and Tiburtina to be precise. Which are some of the most popular destinations outside of the Termini itself. If you do buy on arrival, you’ll be looking for the Stazione FS/Railway Station which is 2 floors up. Your ticket will be ‘Per Termini’ and need validating before you get on the train. The train station can be found at Terminal 3. Not all bus services are created equal. But if you like it cheap and cheerful, and don’t mind being on a bus for up to 70 minutes (depending on traffic and route) – then this is for you. The most popular is the Terravision airport bus. There are other options, which pick up at the different terminals, and have different purchasing options and running times. Terravision picks up at terminal 3, which is easy enough to get to without much stress – especially while carrying your luggage. Cotral – Terminal 2, tickets available from the newsagent stands. Tam Bus – Terminal 3, and goes to Termini and Ostiense Stations too, buy tickets on the bus. SIT Bus Shuttle – Terminal 3, buy tickets on the bus or online for about 8 Euros. Terravision can be around 5 euros one way, doesn’t have a luggage limit, and children under 4 travel for free. Plus, it’s non-stop so you won’t be encountering any extra time than you need to. When it comes to making your way from the airport to the city, you might like to prepare a little. Make sure you have some loose change and a map. Do some research in advance to make sure that your chosen option actually goes where you need to go. And, even though most services will speak plenty of English, you should look to learn a few words in Italian too. *Taxis are currently under regulation to charge no more than 40 Euros, however many unofficial taxis charge more and often take incorrect and longer routes.